What Does Code P0154 Mean? OBD II fault code P0154 is defined as “Oxygen (02) Sensor Circuit – No Activity Detected (Bank 2 Sensor 1)”, and is set when the PCM (Powertrain Control Module) does not detect a signal voltage from the oxygen sensor. On engines with two cylinder heads, “Bank 2” refers to the bank of cylinders that does not contain cylinder #1, and “Sensor 1” refers to the oxygen sensor located before (upstream) of the catalytic converter. Oxygen sensors play a critical role in the fuel, ignition timing, and valve timing strategies calculated by the PCM. The PCM collects information from various sensors around the engine to calculate the most suitable fuel/air ratio, ignition timing setting, as well as VVT/VCS settings to ensure that the engine delivers the most power with the least amount fuel used at any given engine speed or load. Oxygen sensors that are designated by the number “1” measure the exhaust stream before it enters the catalytic converter, and based on the amount of oxygen in the exhaust gas, these sensors generate a signal voltage that is used by the PCM to make adjustments to various settings to maintain peak performance at all times, i.e., generate the most power possible while using the least fuel possible. In practical terms then, if the primary sensor (oxygen sensor #1) does not generate a signal voltage because it is inactive, the PCM is deprived of the information it needs to manage the engine effectively. On most applications, the PCM provides a baseline signal voltage of around 450 millivolts when the sensor is cold. As the heater control circuit warms up the sensor element to bring the sensor into operation sooner, the resistance (which is generally about 8 Ohms) starts to drop, which allows the sensor to generate signal voltages that are based on the amount of oxygen in the exhaust stream. If the PCM detects that it takes longer than about 60 seconds or so for the sensor element to heat up, or that the signal voltage does not move outside of the 390-, to 490 millivolt range, it will deem the oxygen sensor to be inactive, set code P0154, and trigger the CHECK ENGINE light. Note however that the values given here are guidelines only; consult the manual for the vehicle being worked to get the exact values for that vehicle. 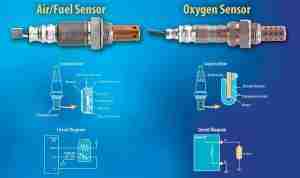 NOTE: Some Japanese vehicles, such as Toyota, do not use conventional oxygen sensors. Instead, these applications use AIR/FUEL RATIO sensors that measure the ratio between fuel and air in the exhaust stream. This type of sensor is NOT interchangeable with conventional oxygen sensors; consult the relevant manual for the correct diagnostic, testing, and repair procedures that pertain to this type of sensor. 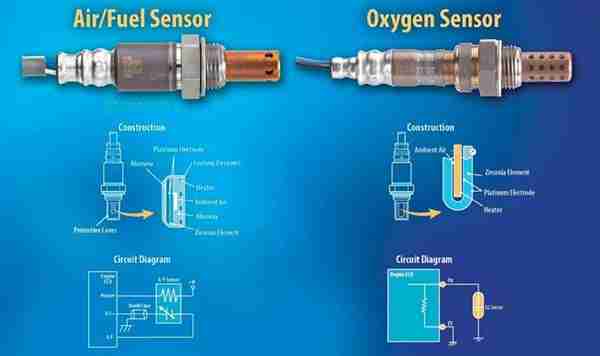 The image below illustrates the differences between conventional oxygen sensors and AIR/FUEL RATIO sensors. What are the common causes of code P0154 ? NOTE: The causes of P0154 are as likely to be caused by aftermarket oil / fuel additives that contain silicone based compounds, and/or internal engine problems as they are likely to be caused by electrical issues in the signal voltage circuit. The panel below illustrates some of the causes of P0154 that are not related to wiring, or other electrical issues. Damage to wiring in the heater control circuit that could influence the time it takes a sensor to reach working temperature – about 6000C. Damage to the signal circuit wiring and/or connectors. Blown fuse(s) in the heater control circuit (where applicable) that prevents the element from heating up. In these cases, there is likely to be a “low input voltage” related code present as well. What are the symptoms of code P0154 ? Severe driveability issues, such as severe loss of power, hesitation upon acceleration, and unexpected/unpredictable stalling. Increased fuel consumption that can vary from slight and barely detectable, to dramatic. Visible black smoke from the tail pipe. Oil dilution caused by over fuelling over extended periods. In extreme cases, engine longevity may suffer due to an overly-rich fuel mixture that washes the protective lubricating film off cylinder walls. How do you troubleshoot code P0154 ? NOTE #1: Refer to the panel of images in the section on “Causes of code P0154” if electrical issues are not found to be the cause of the code. NOTE #2: Before attempting an electrical diagnosis of code P0154, make sure the engine is in good running condition, and that no vacuum-, or serious exhaust leaks are present that could influence the operation of oxygen sensors. Also, make sure there are no rich-, or lean running conditions, and that the engine oil is not contaminated with antifreeze. If any other codes are present along with P0154, resolve these issues first before trying to diagnose P0154. NOTE #3: In a properly functioning oxygen sensor, any change in the throttle setting will produce an almost immediate change in the signal voltage; however, the speed at which the changes occur (as a function of sensor efficiency) can best be judged with the use of an oscilloscope. Bear in mind though that while an oscilloscope can identify incipient problems, the interpretation of waveforms produced on oscilloscopes requires expert knowledge and verified reference data for each application being tested. Therefore, for the purposes of identifying a defective oxygen sensor (if an oscilloscope is not available) the fact that no change in the signal voltage occurs over a discernable period should be enough to confirm that an oxygen sensor is defective. Record all stored trouble codes and available freeze frame data. This data could be helpful if an intermittent fault is diagnosed later on. Consult the manual on the function, routing, and color-coding of all associated wiring, and perform a thorough visual inspection of all wiring associated with the affected sensor. Look for burnt, shorted, or otherwise damaged wiring and connectors. Repair all wiring as required. If there is no visible damage to the wiring, perform resistance, input voltage (reference voltage), ground, and continuity checks on all circuits associated with the affected sensor. Consult the manual on the exact values for the application being worked on, but be sure to disconnect the sensor from the PCM before starting continuity checks to prevent damage to the controller. Since code P0154 indicates a problem in the signal voltage circuit, as opposed to the heater control circuit, pay particular attention to the resistance and continuity values in the signal circuit between the PCM connector and the sensor. These values should match those stated in the manual exactly. However, avoid making repairs to the signal circuit- the better option is always to replace the relevant harness to prevent issues with bad connections and high resistances that could result from poorly executed repairs. Make all repairs required to ensure that the sensor receives full battery voltage. Be aware that on some applications, the heater circuit voltage is supplied by the PCM, in which case the circuit is not protected by a fuse. Consult the manual on how the heater input voltage is delivered to the sensor. NOTE: Since the sensor has a heated element, it is entirely possible that a low battery voltage, poor battery ground, or other continuity issues could affect the time it takes the element to heat up, which is one of the causes that could set code P0154. Follow the testing procedure outlined in the manual to check that full battery voltage reaches the sensor. It goes without saying that the battery voltage/condition must be checked as well; however, in cases where a low battery voltage is present, codes relating to low input voltages on the heater control circuit may be present along with P0154. If all obtained readings fall within the manufacturer’s specification, remove the sensor from the exhaust, and inspect it for signs of discoloration or the presence of any kind of deposit that could destroy the effectiveness of the sensor. Generally speaking, the color of a well-used oxygen sensor should be the same tan color of a healthy, properly functioning spark plug. Compare the sensor to the images in the panel at the top of this section, but be aware that oxygen sensors cannot be cleaned to remove deposits. 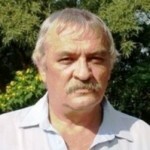 The only reliable remedy is replacement of the sensor, and not to use additives of any sort. It there is no discoloration of, or deposits on the sensor, consult the manual on the exact resistance value of the sensor, and replace it if its resistance does not fall within the manufacturer’s specifications. NOTE: There is little point in replacing the sensor if it shows evidence of oil or antifreeze “poisoning”. In these cases, the underlying problem must be resolved to prevent a continual recurrence of code P0154 and its associated symptoms. If all associated wiring checks out OK, all electrical values within the manufacturers’ specifications, and the affected sensor had been replaced, test drive the vehicle to verify that the repair had been successful. In the unlikely event that the code does return, there may be an intermittent fault present. Finding and repairing intermittent faults can sometimes be very difficult, and in extreme cases, it may be necessary to allow the fault to worsen before an accurate diagnosis and definitive repair can be made. I have a BMW X5 3.0 (E53) 2001. In addition to code P0154, I also have P0174 – System too lean bank 2 and P0172 – system too rich bank 1. PO154 is intermittent and doesn’t come up every time I erase the codes from the system. How is it possible to get a lean and rich code ? is it possible that my 02 Sensor is not working properly?